Public appeal Power Deptt and DA to entrust someone to take care of High Mast light poles which glow during day time. 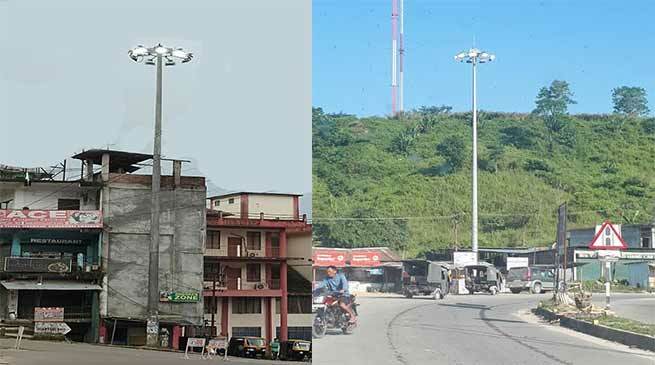 The local denizens while appreciating the state government, power department and capital district administration in providing of light in street through High Mast Light poles in several location of capital complex. While lauding the initiative, the local appeal the power department that several such high mast light post use to glow in day also which need to be checked or if not someone need to be entrusted to take care of wastage of power supply which is not at all necessary in day. High-mast lighting is a tall pole with lighting attached to the top pointing towards the ground, usually but not always used to light a highway or recreational field. It is used at sites requiring lighting over a large area. The pole that the lighting is mounted on is generally at least 30 meters (100 feet) tall (under this height it is referred to as conventional lighting system), while the lighting consists of a luminaire ring surrounding the pole with one or several independent lighting fixtures mounted around it.